I like making new keychains. It is something new and colourful to add to my keys, and after a month the old ones are getting a bit dirty and icky from my messy bag! So I figured I should make a fun Christmas keychain. I picked out some blue and white beads from my collection, you can really make this with any colour scheme and what ever beads you have lying around. 2 x 50cm pieces of cord/leather/wool/string/ribbon etc. Fold both pieces of cord in half and slip the split ring on. Tie a knot just below the split ring. 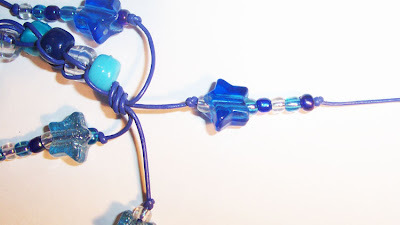 Take the two middle pieces of cord and thread them through 1 large bead. Then take the two outer pieces of cord and thread them through another large bead. Wrap the two middle strands around the bead and thread another bead on. Keep repeating until you use up all your large beads. Knot the cord, then add single knots to each of the single strands. Do 2 knots 1cm from the big knot, and 2 knots 2cm from the big knot. For each strand, add 1 small bead, 1 special bead, 5 small beads and knot the end and trim. Repeat for all 4 strands. This entry was posted in Christmas, Christmas 2011, Christmas Advent, Tutorials on December 20, 2011 by Handmade Cuddles.